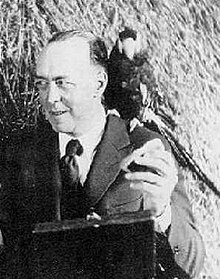 Edgar Rice Burroughs (September 1, 1875 – March 19, 1950) was an American fiction writer best known for his celebrated and prolific output in the adventure and science-fiction genres. Among the most notable of his creations are the jungle hero Tarzan, the heroic Mars adventurer John Carter and the fictional landmass within Earth known as Pellucidar. Burroughs' California ranch is now the center of the Tarzana neighborhood in Los Angeles. Burroughs was born on September 1, 1875, in Chicago, Illinois (he later lived for many years in the suburb of Oak Park), the fourth son of Major George Tyler Burroughs (1833–1913), a businessman and Civil War veteran, and his wife, Mary Evaline (Zieger) Burroughs (1840–1920). His middle name is from his paternal grandmother, Mary Coleman Rice Burroughs (1802-1889). He was of almost entirely English ancestry, with a family line that had been in North America since the Colonial era. Through his Rice grandmother, Burroughs was descended from settler Edmund Rice, one of the English Puritans who moved to Massachusetts Bay Colony in the early 17th Century. He once remarked, "I can trace my ancestry back to Deacon Edmund Rice." The Burroughs side of the family was also of English origin and also emigrated to Massachusetts around the same time. Many of his ancestors fought in the American Revolution. Some of his ancestors settled in Virginia during the colonial period, and Burroughs often emphasized his connection with that side of his family, seeing it as romantic and warlike, and, in fact, could have counted among his close cousins no less than seven signers of the U.S. Declaration of Independence, including his third cousin, four times removed, 2nd President of the United States John Adams. Burroughs was educated at a number of local schools. He then attended Phillips Academy, in Andover, Massachusetts, and then the Michigan Military Academy. Graduating in 1895, and failing the entrance exam for the United States Military Academy at West Point, he became an enlisted soldier with the 7th U.S. Cavalry in Fort Grant, Arizona Territory. After being diagnosed with a heart problem and thus ineligible to serve, he was discharged in 1897. After his discharge Burroughs worked a number of different jobs. During the Chicago influenza epidemic of 1891, he spent half a year at his brother's ranch on the Raft River in Idaho, as a cowboy, drifted somewhat afterward, then worked at his father's Chicago battery factory in 1899, marrying his childhood sweetheart, Emma Hulbert (1876–1944), in January 1900. In 1903, Burroughs joined his brothers, Yale graduates George and Harry, who were, by then, prominent Pocatello area ranchers in southern Idaho, and partners in the Sweetser-Burroughs Mining Company, where he took on managing their ill-fated Snake River gold dredge, a classic bucket-line dredge. The Burroughs brothers were also the sixth cousins, once removed, of famed miner Kate Rice, a brilliant and statuesque Maths professor who, in 1914, became the first female prospector in the Canadian North. Journalist and publisher C. Allen Thorndike Rice was also his third cousin. When the new mine proved unsuccessful, the brothers secured for Burroughs a position with the Oregon Short Line Railroad in Salt Lake City. Burroughs resigned from the railroad in October 1904. ...if people were paid for writing rot such as I read in some of those magazines, that I could write stories just as rotten. As a matter of fact, although I had never written a story, I knew absolutely that I could write stories just as entertaining and probably a whole lot more so than any I chanced to read in those magazines. In 1913, Burroughs and Emma had their third and last child, John Coleman Burroughs (1913–1979), later known for his illustrations of his father's books. In the 1920s, Burroughs became a pilot, purchased a Security Airster S-1, and encouraged his family to learn to fly. Daughter Joan married Tarzan film actor, James Pierce, starring with her husband, as the voice of Jane, during 1932-34 for the Tarzan radio series. The pair were wed for more than forty years, until her death, in 1972. Burroughs divorced Emma in 1934 and, in 1935, married the former actress Florence Gilbert Dearholt, who was the former wife of his friend (who was then remarrying himself), Ashton Dearholt, with whom he had co-founded Burroughs-Tarzan Enterprises while filming The New Adventures of Tarzan. Burroughs adopted the Dearholts' two children. He and Florence divorced in 1942. Burroughs was in his late 60s and was in Honolulu at the time of the Japanese attack on Pearl Harbor. Despite his age, he applied for and received permission to become a war correspondent, becoming one of the oldest U.S. war correspondents during World War II. This period of his life is mentioned in William Brinkley's bestselling novel Don't Go Near the Water. After the war ended, Burroughs moved back to Encino, California, where after many health problems, he died of a heart attack on March 19, 1950, having written almost 80 novels. He is buried at Tarzana, California, US. When he died, he was believed to have been the writer who had made the most from films, earning over $2 million in royalties from 27 Tarzan pictures. The Science Fiction Hall of Fame inducted Burroughs in 2003. Aiming his work at the pulps, Burroughs had his first story, Under the Moons of Mars, serialized by Frank Munsey in the February to July 1912 issues of The All-Story – under the name "Norman Bean" to protect his reputation. [a] Under the Moons of Mars inaugurated the Barsoom series and earned Burroughs US$400 ($10,385 today). It was first published as a book by A. C. McClurg of Chicago in 1917, entitled A Princess of Mars, after three Barsoom sequels had appeared as serials and McClurg had published the first four serial Tarzan novels as books. Burroughs also wrote popular science fiction and fantasy stories involving adventurers from Earth transported to various planets (notably Barsoom, Burroughs's fictional name for Mars, and Amtor, his fictional name for Venus), lost islands, and into the interior of the hollow earth in his Pellucidar stories. He also wrote Westerns and historical romances. Besides those published in All-Story, many of his stories were published in The Argosy magazine. Tarzan was a cultural sensation when introduced. Burroughs was determined to capitalize on Tarzan's popularity in every way possible. He planned to exploit Tarzan through several different media including a syndicated Tarzan comic strip, movies, and merchandise. Experts in the field advised against this course of action, stating that the different media would just end up competing against each other. Burroughs went ahead, however, and proved the experts wrong – the public wanted Tarzan in whatever fashion he was offered. Tarzan remains one of the most successful fictional characters to this day and is a cultural icon. In either 1915 or 1919, Burroughs purchased a large ranch north of Los Angeles, California, which he named "Tarzana". The citizens of the community that sprang up around the ranch voted to adopt that name when their community, Tarzana, California, was formed in 1927. Also, the unincorporated community of Tarzan, Texas, was formally named in 1927 when the US Postal Service accepted the name, reputedly coming from the popularity of the first (silent) Tarzan of the Apes film, starring Elmo Lincoln, and an early "Tarzan" comic strip. Burroughs so influenced real exploration of Mars that an impact crater was named after him. In a Paris Review interview, Ray Bradbury said of Burroughs that "Edgar Rice Burroughs never would have looked upon himself as a social mover and shaker with social obligations. But as it turns out – and I love to say it because it upsets everyone terribly – Burroughs is probably the most influential writer in the entire history of the world." Bradbury continued that "By giving romance and adventure to a whole generation of boys, Burroughs caused them to go out and decide to become special." By 1963, Floyd C. Gale of Galaxy Science Fiction wrote when discussing reprints of several Burroughs novels by Ace Books, "an entire generation has grown up inexplicably Burroughs-less". He stated that most of the author's books had been out of print for years and that only the "occasional laughable Tarzan film" reminded public of his fiction. Gale reported his surprise that after two decades his books were again available, with Canaveral Press, Dover Publications, and Ballantine Books also reprinting them. Few critical books have arisen concerning Burroughs. From an academic standpoint, the most helpful are Erling Holtsmark's two books: Tarzan and Tradition and Edgar Rice Burroughs; Stan Galloway's The Teenage Tarzan: A Literary Analysis of Edgar Rice Burroughs' Jungle Tales of Tarzan; and Richard Lupoff's two books: Master of Adventure: Edgar Rice Burroughs and Barsoom: Edgar Rice Burroughs and the Martian Vision. Galloway was identified by James Gunn as "one of the half-dozen finest Burroughs scholars in the world"; Galloway called Holtsmark his "most important predecessor." These three texts have been published by various houses in one or two volumes. Adding to the confusion, some editions have the original (significantly longer) introduction to Part I from the first publication as a magazine serial, and others have the shorter version from the first book publication, which included all three parts under the title The Moon Maid. ^ A poem by Burroughs was published on October 15, 1910, in the Chicago Tribune as "by Normal Bean", and two more were published in the Tribune in 1914 and 1915. "Norman" was an All-Story typesetter's presumptive correction of "Normal". Burroughs used his own name for his other publications. ^ Descendants of Edmund Rice: The First Nine Generations, Edmund Rice (1638) Association, 2010 . ^ "Edmund Rice Six-Generation Database Online". Edmund Rice (1638) Association. Retrieved January 27, 2011. 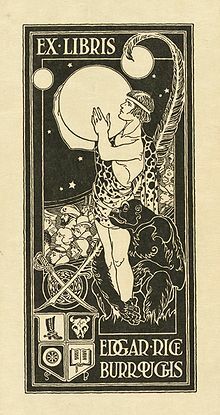 ^ "Edgar Rice Burroughs". 16 August 2017. ^ Taliaferro, John. Tarzan Forever: The Life of Edgar Rice Burroughs, Creator of Tarzan, pp. 15, 27. ^ Slotkin, Richard (1998). Gunfighter Nation. University of Oklahoma Press. p. 196. ISBN 0-8061-3031-8. ^ Rice, Michael A. Edmund Rice (1638) Association, Inc.: "Meet Some of Edmund Rice’s Descendants: Notable Writers & Entertainers", page 11, Accessed October 11, 2017. ^ John, Finn J.D. Offbeat Oregon: "Ill-starred gold-mining venture worked out well for Tarzan fans", March 8, 2015, Accessed October 11, 2017. ^ Holtsmark 1986, pp. 3–4. ^ Holtsmark 1986, p. 5. ^ Burroughs, Edgar Rice (October 27, 1929). "How I Wrote the Tarzan Stories". Washington Post, New York World (Sunday supplement). ERBZine.com. ^ Nelson, V. J. (15 May 2008). "Obituaries / Danton Burroughs, 1944 - 2008; Tarzan Creator's Heir Protected the Legacy". Los Angeles Times – via ProQuest. ^ "A Plane-Crazy America". AOPA Pilot. May 2014. ^ "Joan Burroughs". Retrieved 14 February 2015. ^ Holtsmark 1986, pp. 12–13. ^ Toland, John (1970). The Rising Sun (2003 Modern Library Paperback ed.). Random House. p. 220. ISBN 0-8129-6858-1. ^ Holtsmark 1986, pp. 13–15. ^ "'Tarzan' Paid Off Big to Burroughs". Variety. March 22, 1950. p. 7. Retrieved April 2, 2018. ^ "Burroughs, Edgar Rice" Archived 2012-10-16 at the Wayback Machine. The Locus Index to SF Awards: Index of Literary Nominees. Locus Publications. Retrieved April 8, 2013. ^ Science Fiction and Fantasy Hall of Fame (official website of the hall of fame to 2004), Mid American Science Fiction and Fantasy Conventions, archived from the original on 2013-05-21, retrieved 2013-03-22 . ^ a b c d Edgar Rice Burroughs at the Internet Speculative Fiction Database (ISFDB). Retrieved April 8, 2013. Select a title to see its linked publication history and general information. Select a particular edition (title) for more data at that level, such as a front cover image or linked contents. ^ "A Virtual Visit to the Nell Dismukes McWhorter Memorial Edgar Rice Burroughs Collection", ERBzine, 4 (19) , with photographs. ^ a b c Robinson, Frank M, "The Story Behind the Original All-Story", American Zoetrope, 4 (1), retrieved April 8, 2013 . ^ Tarzana Community Profile (PDF), US: NOAA, archived from the original (PDF) on February 4, 2012, retrieved July 4, 2012 . ^ Holtsmark 1986, pp. 9–10. ^ Weller, Interviewed by Sam (4 February 2019). "Ray Bradbury, The Art of Fiction No. 203" – via www.theparisreview.org. ^ Kipling, Rudyard (1937). "8: Working Tools". Something of Myself. London: Macmillan & Co.
^ Gale, Floyd C. (June 1963). "Galaxy's 5 Star Shelf". Galaxy Science Fiction. pp. 135–138. ^ Gale, Floyd C. (October 1963). "Galaxy's 5 Star Shelf". Galaxy Science Fiction. pp. 119–123. ^ Holtsmark, Erling B. Tarzan and Tradition: Classical Myth in Popular Literature. Westport, CT: Greenwood, 1981. ^ Holtsmark, Erling B. Edgar Rice Burroughs. Twayne's United States Author Series. Boston: Twayne, 1986. ^ Galloway, Stan. The Teenage Tarzan: A Literary Analysis of Edgar Rice Burroughs' Jungle Tales of Tarzan. Jefferson, NC: McFarland, 2010. ^ Lupoff, Richard. Master of Adventure: Edgar Rice Burroughs. Lincoln: University of Nebraska Press, 2005. ^ Lupoff, Richard. Barsoom: Edgar Rice Burroughs and the Martian Vision. Baltimore: Mirage Press, 1976. ^ Gunn, James. Foreword. The Teenage Tarzan by Stan Galloway. Jefferson, NC: McFarland, 2010. p. 3. ER Burroughs 1st UK editions list with pictures of the books, Google . "Edgar Rice Burroughs biography". Science Fiction and Fantasy Hall of Fame. This page was last edited on 24 April 2019, at 19:02 (UTC).